Bartow White provides us with a rare opportunity to learn about medicine at a pivotal point in American medical history in the Hudson Valley. Bartow White’s father, Ebenezer, was a physician who served in the Revolutionary War stationed in Westchester County. Bartow White, born at the dawn of this war, grew up in the Westchester County area and once he was old enough removed to a location more southeast near the New York-New Jersey border to engage in an apprenticeship with the famous physician Valentine Seaman. Valentine Seaman was best known for his work as a physician and early epidemiologist specializing in what would soon be called medical topography. Seaman believe that local landform and its association with people could be used to explain some of the more puzzling epidemics to develop in the local seaport areas. At about the time Bartow White began learning medicine under Dr. Seaman, Dr. Seaman was already producing maps to define disease behaviors, presenting them to a council he was associated with and headed by local government leaders in New York City. In 1802, the first published version of these maps appeared in the local magazine Medical Repository. This map was used to promote his personal theory on the origins of a recurring epidemic disease patterns most influential upon the local economy–yellow fever. Progress in the re-establishment of a medical school in the New York City and Philadelphia areas made it such that Bartow could attend some lectures offered there to learn medicine as well. As Bartow engaged in this new addition to the medical training program, he was exposed to even more varieties of these new theories arising for disease, none of which were based on the old four humours or alkaline disease theories that prevailed during the pre-Revolutionary war years. To newcomers like Bartow, the understanding of diseases and their causes and the ways in which the body reacts to disease, had finally made important advancements. During this time, two major theories for disease had surfaced since the end of the war. The first was the animalcules theory, in which small organisms were being documented as the cause for many illnesses. Some organisms like intestinal worms were large enough to see without any assistance of a magnifier, and had long been known to be a cause for some maladies, such as the African tapeworm, a pathogenic organism asociated with diseases as early as the mid-14th century, due to shipping between Europe and Africa. As smaller and smaller versions of worms were documented, the use of the hand lens was converted to the use of micrscopes to identify disease causing organisms. Sometimes these “organisms” felt to be responsible were actually human cells, like the cells in the blood that were initially defined as the seminal cause for certain epidemic diseases patterns. But by the 1790s, some physicians researching animal born organisms found much smaller critters that they considered responsible for other types of disease. One of the first physicians in the United States to acomplish this was a physician affiliated with the newly forming Transylvania School of medicine in Kentucky. 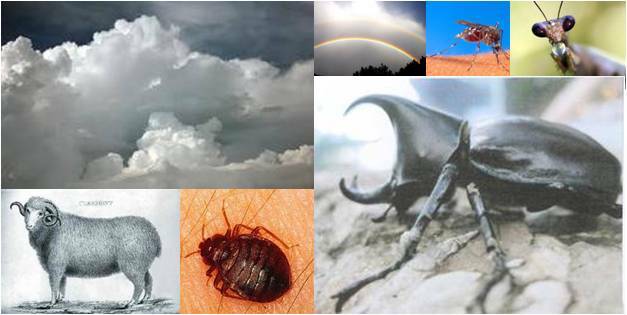 Aside from “animalcules”, climate and weather were strongly associated with given disease patterns. 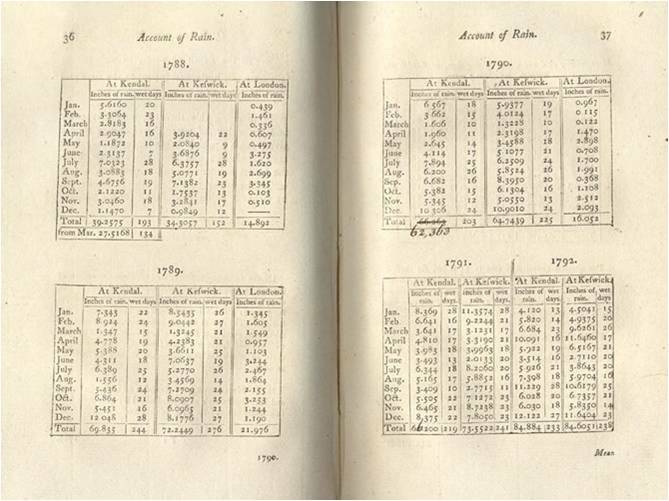 Between approximately 1805 and 1840, a number of physicians researching disease patterns came to associate disease with various topographic and climatic events that took palce in nature. Due to this work a water-based theory was developed for spatially well-defined disease, like the relationship drawn between alkaline soils and geological formations, water chemistry and local disease development. Another theory for disease patterns occuring in well defined epidemic and endemic patterns was the contagion theory, which stated that contagion developed in certain palces due to decaying materials, such as debris, human garbage, and animal carcasses found floating in large colelctions along certain parts of the shoreline, a philosophy of disease evolution strongly supported by one of the writings of one of the most influential writers for the time, Thomas Paine. Solid evidence for this theory for disease was further developed by New York physician Samuel Mitchell, leading him to develop one of the most influential theoreies for diseases patterns to evolve within the New York-Hudson Valley setting fbetween 1810 and 1840. During his training in academia, Bartow White attendedsome of the first of these lectures ever given in the United States Mitchell’s unique theories for disease development and patterns of migration. At these lectures he would have also learned about all of the other new theories out there being proposed for diseases, including some proposed bythe nearby Philadelphia medica school that were quite different from those of Samuel Mitchell. In Bartow White’s mind, the most important addition to medical thinking at this time was the concept that environment and weather had a lot to do with the development of illness in the body and the belief that the environment provided some major triggers for pathogenesis. For the next several decades, much of this philosophy heavily influenced his practice of medicine and the lessons he provided to others learning the skills of the trade as his apprentices. The influences of Samuel Mitchell upon many of his local colleagues led Bartow White to become a physician who believed in the many environmentally-based theories for illness that were out there. Regional climate, local weather irregularities, high humidity in combination with heavy vegetation, the guiding of seasonal winds over water bodies thus introducing additional sources of humidity, mist, and swampgases were all major observations studies and recorded by physicians as part of the development of these new theories being published. Dr. White based most of his medical practice on this philosophy, and developed a number of business ventures designed to produce ways in which to prevent such epidmic and endemic patterns from recurring during the future years. Due to Valentine Seaman, Samuel Mitchell, and others whose supporting points of view were also published in the Medical Repository journal, a significant amount of political and intellectual competition ensued over the years betwen New York and Philadelphia medical school staff members and physicians. At times it appeared that the Rushites (so named due to their important physician Benjamin Rush of the Revolutionary War) were losing this battle to the doctors in New York following the works of Mitchell. For a while, New York physicians had their most important lead on Philadelphia students and graduates due to the unique geographically defined opportunity the Hudson Valley presented them with–it had an ever-changing medical topography and disease behavior patterns of the Hudson Valley that took a irect south to north route, allowing for a unique blending of latitudinal, topographic, elevational, and climatic changes to become part of any epidemiological study. This put New York physicians slightly ahead of Philadelphia physicians in terms of their understanding and documentation of geography based disease patterns. Bartow White benefitted significantly from this unique aspect of New York medical training thoughout much of his life span, and during his professional years made important contributions to the understanding of this philosophy of disease and its possible preventive nature. When Bartow White completed his training under Valentine Seaman, and at least 5 months of lectures given in association with the New York medical school, he was well ahead of the skills, knowledge and training when compared with other physicians serving the middle Hudson Valley region. His knowledge in a field that had progressed significantly since the colonial years enabled him to take advantage of this new library of medical knowledge and training bestowed upon him. Around 1800, he removed to Fishkill, NY, and became the first physician to practice medicine and surgery there with a considerable degree of recent intellectual upbringing. This immediately led to his rise in popularity and medical success in a small town now famous due to the purposes it served during the war. Due to his residency in this setting and the assistance he provided to the local economy due to his medical beliefs an practices as a physician focused on weather, the environment and health, a number local industries blossomed almost overnight in the valley, in particular in Dutchess County. Agricultural food products industries related to dairy products, poultry and eggs, the raising of sheep, the practice of outdoor recreation such as riding horseback as a form of exercise, all of these uniquely rural countryside practices made Dr. White’s continuing work as physician very much appreciated by the local agricultural and livestock communities in need of economic growth and change. In Fishkill (residing on land later used for the development of a shopping mall in the village Fishkill, very close to the road in this setting now called White Rd. ), Bartow had a fairly large house that he moved into, and began practicing medicine at the office on Main street (now Auchmoody’s funeral home), then being operated by local physician Dr. Hunting Sherrill. Bartow’s private estate, about a quarter of a mile down the road, had a large horseshoe shaped path laid for carraiges which led to the front entrance of the home. (Most of this information on his house and workplace came to me thanks to Willa Skinner, Fishkill historian, and her book on the history of the Fishkill area.) Along the way, one passed a stall in which he kept his carriage and horses. Towards the center of his sizeable “front yard”, there was a large pasture-like field (the parking lot today), where he at least in his later years kept several dozen head of sheep (according to his will in Poughkeepsie Court House). Apparently this sheep raising was initiated fairly early in his professional life. We know this because both he and his wife were associated with local groups that met in order to provide servics to the poor, and help to promote the local wool industries then being established. Due to sheep raising, Dr. White was in search of much some farmhands. For this reason at least twice he became involved in the programs designed to assist in the migration of German and Irish families to the United States during the 1840s and 1850s, for short term use of their skills as servants. 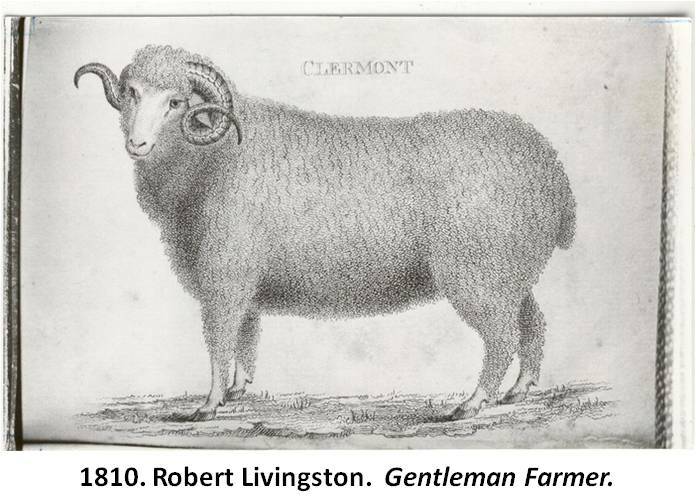 This helped him to futher develop and promote the local plans underway to improve the sheep industry in the Hudson Valley. The first question one asks about such a practice engaged in by a physician is ‘why raise sheep?’ It ends up that by being involved with the sheep industry, Bartow White put himself in close association with one of the most important economically successful families in Dutchess County–the Livingstons. Not much evidence in the form of personal or professional communications can be found between Dr. White and the Livingstons, but a strong sharing of health beliefs made the two of these members of the local community strongly influential upon the events that would next take place in Hudson valley medical history. One member of Livingston family was focused on the healthiness of Hudson Valley’s unique wind patterns and local climate, and another on the need for developing a sheep industry in this region. The Livingstons believed that climate and topography had everything to do how one reacted to the environmental stresses that local residents with “unacclimated bodies” had to these potential disease causing agents. One member of this family even went so far as to take a trip to Spain, and bring back with him the first Merlino sheep to be raised at his new Agricultural Research facility located up in what is now the Rhinebeck-Redhook area. In essence, the stage was set for a very large livestock industry to be established that could become one of the most important sources of income for these local upstate communities. Bartow White did everything possible to become involved with this rapidly growing industry, adding to its successes in every way possible as both an entrepreneur and physician. Interestingly, Bartow White had other links to local history already documented by my work, involving the Osborn family. Cornelius Osborn, the patron of this family, passed in 1782/3, just before the war officially was considered officially over. His oldest son, James, was already practicing medicine, having been trained by Cornelius. Another son, Peter, the second oldest, was perhaps partially trained by his father, but received most of his knowledge working alongside others in the group with which he served during the war, mostly as another rifleman and field surgeon’s assistant. The youngest son, Thomas, was too young to serve either as a rifleman or an assistant to some field surgeon, and so benefitted by learning medicine by individual trained in both the old school of medicine and by Bartow White. Accompanying Thomas in this new school of thinking about diseases and health was his cousin Cornelius Remsen, who came to Fishkill from Long Island about the time that Bartow White had moved there. Cornelius Remsen would later become on of the most important and influential doctors to reside in the Wappingers Falls area, owning a large mansion as well as lands he would later donate to the local church in order to assist the village in continuing its rapid growth then taking place. In just a few years, Bartow White’s influences in the valley had already made their way further north along the river by at least 60 miles, and further eastward inland from the rivers edge by about 20 or 30 miles. Between 1802 and 1825, these changes would make their way as far north and the Canadian border, and as far west as Buffalo. During the 1840s, once Bartow was elected to serve in Congress, his influences became statewide almost overnight. These influences would continue for the next 20 to 25 years. It was now a popular belief that diseases were heavily influenced by weather and local climatic features. The use of wool clothing, made with merlino sheep wool, as sock, pants, shirts and jackets, became on the local region’s most important commodities for both New York city and rural-hinterland community residents. Even with the transition in medical philosophy from the notion that disease resulted from “animalcules” and other very small microscopic animals, an idea that also a part of medical philosophy for quite a long time (i.e. its 1720s popularity due to Lancisi’s theory for animalcules and disease), the topographic and climatic theories for disease based on acclimation and adaptation based lines of reasoning remained popular until about the med-1880s (a very Lamarckian and later Darwinian concept). It took at least a decade to convince old timers that “microbes” or germs were this important to many diseases previously misunderstood and misinterpreted. Dr. Bartow White’s career with congress and medicine unfortunately ended due to the initiation of a seizure condition. Few details are known about exactly what kind of condition this was. It is possible he developed seizures due to some sort of head trauma he experienced, or other stress brought onto the body due to illness and typical life experiences for his midage years. However, there is one item we are provided with that provides some very important insights into Bartow White’s seizure state that forced him to retire during the late 1850s or early 1860s. The last recipe in Cornelius Osborn’s recipe book is for a form of epilepsy that results in seizures impacting only a small part of the body, one small series of muscles at a time, in synchrony, causing a hand or limb to go numb and then demonstrate signs of muscle twitching as the seizure progresses from finger to hand to forearm, or other closely associated parts of the body. The last recipes in Osborn’s vade mecum (pages 78 to 80) are penned by a different writer, using a new pen that bore a very narrow tip, not at all like the feather pen Osborn used to construct the first recipes. “The Epileptics” recipe suggest the practitioner “foment the parts affected”. This can only be linked to a local form of seizure activity known as Jacksonian Epilepsy, coincidentally a form of epilepsy so named due to its first documentation by English Neurologist John Hughlings Jackson (this phenomenon often referred to as “the Jacksonian march” as this electric activity travelled across the surface of the brain, and was considered locally restricted or focal (versus “general” causing unconsciousness)). Jackson’s description and definition of this event was first published in 1863, two years before Bartow White’s death.